Today's post by Gordon Laco, supplier of traditional sailing hardware, reserve officer for the Royal Canadian Navy & historical consultant for documentaries and feature films including being the lead historical consultant for the film Master and Commander: The Far Side of the World. 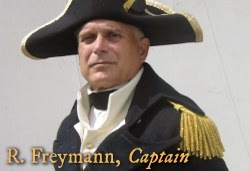 Captain Freymann: Mr Hamilton, I see you’ve about completed your morning preparations – you’re ready to face the new day I presume? Good. With no further delay I’ll have her underway on starboard tack; we shall depart the harbour clearing the leeward cape without need to take a board to windward. Carry on. 1st Lt Hamilton: ALL HANDS, ALL HANDS, HANDS TO YOUR STATIONS, PREPARE TO GET UNDER WAY. (more quietly, addressing the Master) Mr. MacLachlan, we shall recover the starboard hauser and hang by the port till I give the word. Mind you do this smartly, not like last time. HIS eyes are upon us. Pray do not place young Moreton where you had him last time. We cannot bear another drama. 1st Lt Hamilton: starborlines away aloft! Cast off your fore and main tops’l gaskets, cast off your forestaysail gaskets! Stand by to haul away! 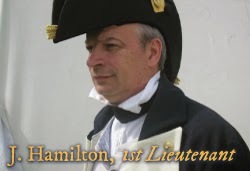 1st Lt Hamilton: Waisters... Brace your yards to starboard.... Forward there, brace your foreyards aback! 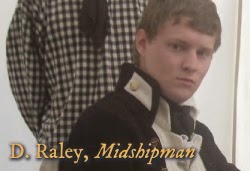 1st Lt Hamilton: Let fall your fore and main topsails! Haul away your foretops’l halyard!... (A pause of some minutes as the foretopsail yard creeps up its mast...) Haul away your forestaysail halyards! Back your forestaysail! Haul away your foretopsail sheets! Helm down! 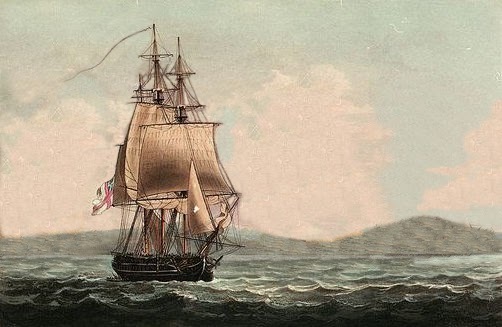 1st Lt Hamilton: (watching the ship gather sternway, her head being pushed to port by the backed staysail and foretopsail...) HAUL AWAY SMARTLY YOUR MAIN TOPSAIL HALYARDS SMARTLY! CAST OFF YOUR DRIVER BRAILS! MIDSHIPS HELM! 1st Lt Hamilton: HAUL AWAY YOUR MAIN TOPS’L SHEETS! FORWARD THERE.... TACK THE FORE STAYS’L! TACK THE FORETOPS’L! AFTERGUARD...HAUL AWAY YOUR DRIVER SHEET! SET MAIN AND MIZZEN STAYSAILS! As the frigate gathers way the leeway decreases.... With yards braced hard on starboard tack she slowly accelerates and begins answering her helm. The 1st Lt glances at the Captain who has been standing aft during this... And gives an imperceptible nod. 1st Lt Hamilton: (to the Master) Mr. MacLachlan, I’ll have t’gallants and upper staysails on her...carry on. It all seemed to go well; much relieved, the 1st Lt turns to write up the deck log. Glancing astern, he is horrified to see a boat, his ship’s launch, struggling to keep up but being left behind by the gliding frigate. He had forgotten to recover the party he’d sent to the buoy.... His eye darts to the Captain, who of course had not forgotten the boat, and is staring at him with his right eyebrow arched, arms folded, and an indecipherable expression on his face. Also interesting how this entry is the first Google hit for "cavelle cleat".